I’d like to officially welcome summer 2010 to Long Island! One of my all-time, absolute favorite things in the world to do during the summer is take my Saturday morning breakfast to the beach. What’s better than a picnic on the sand with some crashing postcard-like waves in the background? This may sound cheesy and cliché for a Long Islander, but it never gets old. Of course I have to search out the perfect spot to set up my blanket, far away from screaming children, blasting techno music or chatty teenagers. A picnic is supposed to be peaceful! I try to pack as light as I can manage. Lugging a huge, overstuffed cooler for miles takes some of the fun out of the trip. What’s a delicious breakfast treat that fits in a small lunch box and doesn’t require a lot of major condiments or assembly? Muffins! Sadly, muffins are not terribly good for you. The next time you’re in a deli or bakery, check out the muffin flavors; chocolate chip, DOUBLE chocolate chip, coffee cake, apple cinnamon. They all sound (and inevitably taste) like dessert. Don’t get me wrong, I love dessert, but starting off the day with something super sweet has me headed down the wrong path before 9AM. 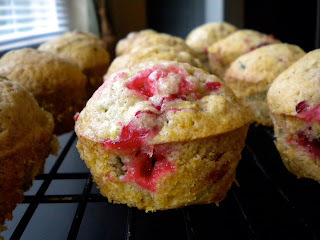 Unfortunately, the day I made these CRANBERRY-ZUCCHINI MUFFINS, it rained. Bummer! So I had a picnic in the living room instead. I was looking for a lighter muffin recipe to try and stumbled across this one online. It’s apparently from Martha Stewart’s Baking Handbook. I happen to think that Martha Stewart is some sort of android. Anyone who would hollow out gourds and string them together to make a party lantern freaks me out. 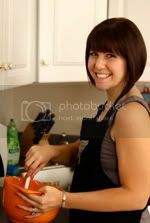 But the woman is a baking expert, so I trusted her on this one. The zucchini has the same effect as it does in zucchini bread. The muffins don’t actually taste like zucchini, but they stay nice and moist without having to add a whole lot of oil. The cranberries pop in the oven and add a sour, gooeyness that I just love. If fresh cranberries aren’t in season, the frozen ones work just fine. This recipe is just sweet enough. The muffins don’t taste like dessert and I found them to be surprisingly filling. I’d like to take a second crack at the recipe, replacing some of the white flour for whole wheat and some of the white sugar for brown. I’ll keep you posted on how the substitutions work out. In the meantime, think of these as a treat. They certainly aren’t as bad for you as the oversized, over-sweetened bakery variety. Just don’t overindulge. As a true berry addict, I can't wait to try them. I'll try some subs too, maybe some blueberries, some wheat flour. I'll let you know how they come out. Thanks for the great recipe!